The main difference between cache and RAM is that the cache is a fast memory component that stores frequently used data by the CPU while RAM is a computing device that stores data and programs currently used by the CPU. Cache is a smaller and fast memory component in the computer. It holds the copies of data that are commonly used by the CPU. On the other hand, RAM is the primary memory that stores programs and data in current use. It helps the CPU to access data within a minimum amount of time. Cache is faster than RAM. If the data is not available in the cache, the CPU will access the RAM. The cache stores the frequently used data by the CPU. The CPU first checks the cache for the required data. Even though the RAM is fast, it is not as fast as the cache. Therefore, storing the commonly required data in the cache is beneficial to increase the computation speed. 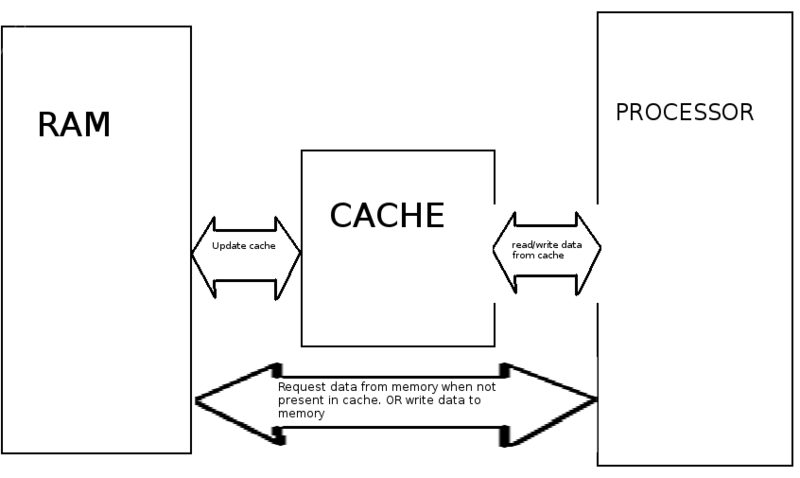 There are three types of cache. The level 1 cache is the smallest. It is located inside the CPU or the processor. So, it runs at the same speed as the CPU. Level 2 and level 3 caches are external. Level 2 cache is larger than level 1 cache. If the required data is not available in level 1 cache, the CPU checks the level 2 cache. If the required data is not available in both level 1 and level 2 caches, the CPU checks the level 3 cache. If the required data is not available in any of these caches, the CPU will access the RAM. Level 1 cache is the fastest cache of all. A CPU can have multiple cores. A core is the execution unit of the CPU. Each core can have separate level 1 and level 2 caches. The level 3 cache is shared among all cores. RAM is also known as the main memory or the primary memory. Usually, the programs are stored on the hard disk. The CPU requires more time to access the hard disk. Therefore, the programs that should execute are brought into the RAM so that they can be executed faster. It takes only a short time to access data from the RAM when compared to accessing data from the secondary storage medium such as hard disk, and solid state drive. RAM stands for Random Access Memory. It is a volatile memory, which requires a continuous flow of power to maintain the data. Interruptions or power failures can delete the data stored in the RAM. It can have 32-bit or 64-bit data paths. This refers to the number of bits that are transferred in 1 clock cycle. A computer with more RAM will have a higher performance. 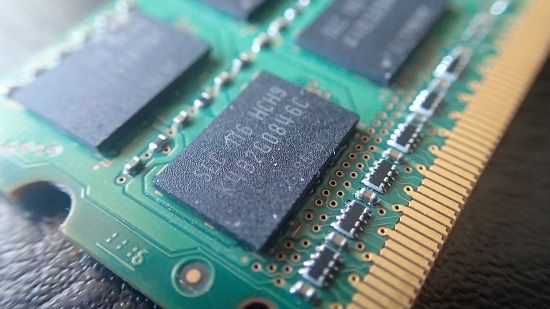 There are mainly two types of RAM called SRAM (Static RAM) and DRAM (Dynamic RAM). The DRAM consists of a capacitor and a transistor. The capacitor can change, discharge and represent the logical one and logical zero. There is a leakage current due to the capacitor, and it causes the capacitor to lose charge. This can delete the content in DRAM. Therefore, DRAM requires constant refresh cycles to retain data. Moreover, SRAM contains flip-flops to store data. It does not require refresh cycles to retain data like in DRAM. SRAM is fast and expensive than DRAM. A type of RAM called SRAM is used for cache. Cache is a component in the computer that stores data so that future requests for that data can be served faster. RAM is a form of computer data storage that stores data and machine code currently being used. RAM is faster than secondary storage mediums, but it is not as fast as the cache. Although RAM is expensive, it is not expensive as a cache. The capacity of cache is smaller than RAM, which has a higher capacity. The cache holds frequently used data by the CPU. RAM holds programs and data that are currently executed by the CPU. Both cache and RAM are volatile memory. 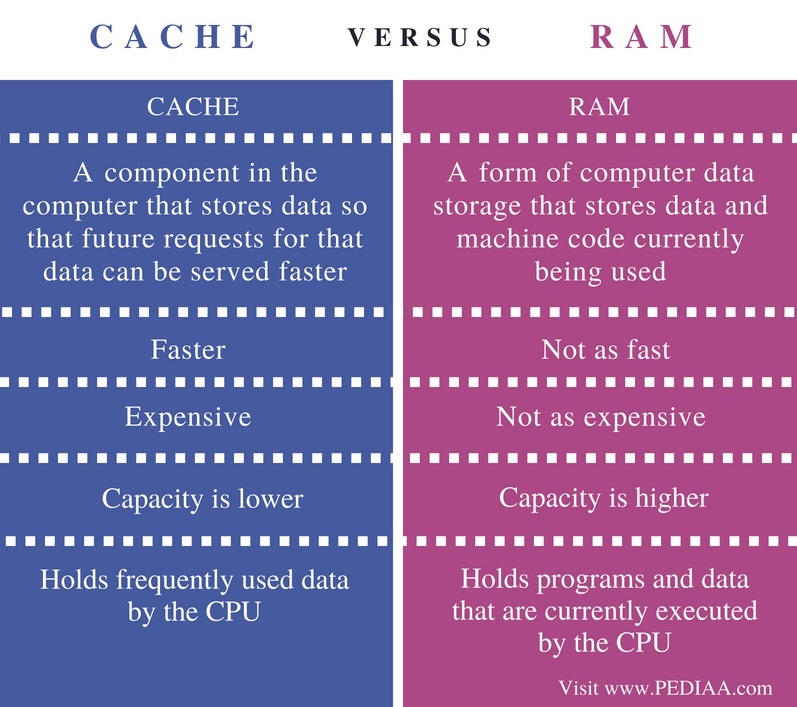 The difference between cache and RAM is that the cache is a fast memory component that stores the frequently used data by the CPU while RAM is a computing device that stores data and programs currently used by the CPU. In brief, the cache is faster and expensive than RAM. 1. CPU Cache Explained – What Is Cache Memory?, PowerCert Animated Videos, 27 Nov. 2016, Available here. 2. RAM Explained – Random Access Memory, PowerCert Animated Videos, 2 Oct. 2016, Available here.